I've been playing around with Payback on my iPhone for the past week or so. The game is a top down action game very reminiscent of the original Grand Theft Auto. Did I say reminiscent? It's really closer to a copycat. I haven't really played it enough yet to write up a formal review, but the game does seem to have some interesting things going for it. You play by tilting the device around and then holding a virtual forward or back button. There's also a button to attack, another to enter a vehicle and a third that lets you switch between weapons. It's pretty fun to mess around with, but doesn't seem to have the cohesion of a genuine GTA title, it's also most certainly missing the macabre humor that makes the original title so much fun to play. 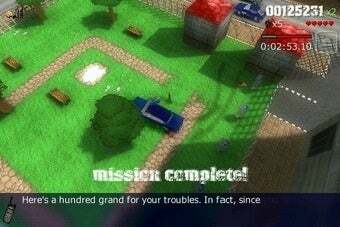 For instance, you get points for killing people, blowing things up, stealing vehicles, but there's not a whole lot to tip you off that it's an absurdists adventure. Like getting extra points for mowing down a weaving line of Hare Krishnas. The extensive music catalog, sizable city and sandbox setting might still make the game's $7 worthwhile. Stay tuned for our full review down the line.